An original oil on canvas 92 x 69 cm prepared by Norman Rockwell as a cover art for the Saturday Evening Post passed at Bonhams on January 27, 2010, lot 1131. Coming now from the deceased estate of Debbie Reynolds, it passed at Profiles in History in October 2017 with an excessive estimate. It is now estimated $ 800K for sale by Heritage in Dallas on May 4, lot 68002. On May 29, 1926, the Saturday Evening Post celebrates the 150th anniversary of the Declaration of Independence of the United States. Norman Rockwell symbolizes this event by showing Benjamin Franklin, quill pen in hand for signing the document, his face turned towards the viewer. This figure on a light background is a nice example of the usual care of the artist for readability. This image meets a dual logics. First : Franklin, subtle polemicist, renowned scientist, ambassador of freedom, alter ego of the "Poor Richard", has remained a popular figure. On the other hand, the Saturday Evening Post claimed to be the successor of the Pennsylvania Gazette founded by him. Norman Rockwell left New Rochelle NY in 1939 and set up his studio in Arlington, Vermont. He enjoys watching and photographing the faces of boys and the picturesque ruddy features of old men. His job for the Saturday Evening Post remains just as regular. Around that time the magazine covers are modernized, gradually giving up their traditional white background. The characters are best staged in such a colorful surrounding and Rockwell more regularly offers groups on the cover including his Willie Gillis war series in 1941. The covers made by Rockwell are of course the most visible elements of his art but he also works to illustrate the inside pages. The image of Blacksmith's Boy - Heel and Toe is published on a double page in the Saturday Evening Post of November 2, 1940. The short story narrates a contest in a forge between the local blacksmith and a young itinerant champion. The very excited villagers are betting on the result. The artist can better express his verve than on a cover because the image is printed in double page without inscriptions. It shows the two champions in full effort encouraged by 21 often excessive characters, including within this crowd a self-portrait gently turned towards the spectator. Under both anvils the accumulation of horseshoes indicates a tie in the competition. The story exalts this moment when the endurance of the old craftsman allows him to catch up and surpass his rival. The oil on canvas 89 x 178 cm is very large for this artist. It is part of an important group of artworks offered in de-accessioning by the Berkshire Museum. Originally scheduled by Sotheby's for November 13, 2017, the sale had been suspended. A compromise was found. The masterpiece of this operation, Shuffleton's Barbershop also by Rockwell, was purchased privately for the museum being built by George Lucas in Los Angeles. Blacksmith's Boy is estimated $ 7M for sale by Sotheby's in New York on May 23, lot 43. Please watch the video shared by the auction house. 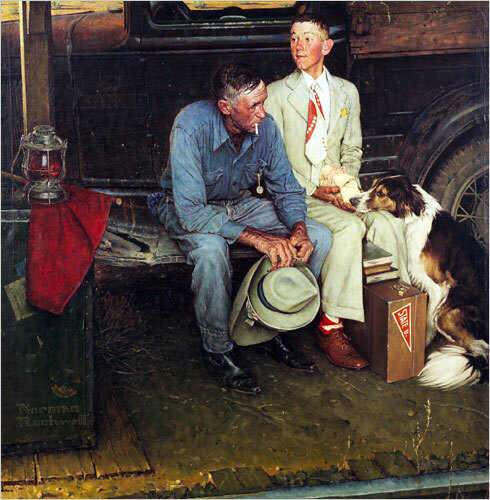 Norman Rockwell, who was the most prolific illustrator of the American patriotism, became linked with the Boy Scouts early in his career and even was from 1913 to 1916 the artistic editor of their magazine. From 1916, he became famous for his cover illustrations of the Saturday Evening Post. Yet another derivative would spread his art within all regions and all social classes of the United States: the calendar. His co-operation with the publisher Brown & Bigelow starts in 1925. On July 27 in Reno, The Coeur d'Alene Art Auction sells an oil on canvas 100 x 69 cm, estimated $ 4M, unambiguously titled A Scout is loyal. Painted in 1940, this image was published in a calendar for 1942. In February of the same year, it also illustrated the cover of the magazine of the Boy Scouts of America. The boy is an almost adult teenager. Concentrated exclusively in his loyalty, he is not disturbed by the protective shadows of Lincoln and Washington. Patriotic symbols are added in the scene. Good price, $ 3.8 million before fees, for this painting typical of Rockwell's patriotic inspiration. The image is shared post sale by Auction Central News (second from top). Each week, American readers eagerly awaited the next cover of their favorite magazine, the Saturday Evening Post. They recognized perfectly themselves and their neighbours as the characters of everyday life placed by Norman Rockwell in gently comic situations. Then came the war. Rockwell was able to extend his comic skill by pointing the life in the barracks, encouraging patriotism without showing fights. GI Willie Gillis, invented by the artist, appears for the first time on the cover on October 4, 1941. The funny and endearing caricature shows the little man in a situation that all soldiers once lived. He received the first package of food and sweets from Mom, and he does not know how to deal with six hilarious burly comrades waiting for a share in tight ranks behind him. The original art for this cover is an oil on canvas, 127 x 100 cm. It is estimated $ 3M, for sale by Susanin's in Chicago on December 1. Here is the link to the catalog on LiveAuctioneers. Up to the end of the war, Rockwell feeds these topics of military humor. A very patriotic painting from 1942 starring Rosie the woman soldier was sold $ 5M including premium by Sotheby's on May 21, 2002. The homecoming of the Marine in 1945 was sold for $ 9.2 million including premium on May 24, 2006, also by Sotheby's. The result recorded on LiveAuctioneers, $ 2.8 million before fees, was confirmed by the auction house to the Chicago Tribune. The US entry into the war in 1941 did not create opposition but people were inevitably disturbed by this new situation. Norman Rockwell does not commit to politics but his covers of the Saturday Evening Post contribute to maintain the patriotic morale. War is necessary to keep the freedoms. In 1943, Rockwell prepares a set of posters illustrating the Four Freedoms as defined by President Roosevelt in his 1941 State of the Union speech : Freedom of Speech, Freedom of Worship, Freedom from Want, Freedom from Fear. A new presidential election is held in November 1944. The outgoing president is ill but considers that America must not change his pilote. His Republican challenger Thomas E. Dewey opposes him on some social themes but does not discuss military affairs and foreign policy. Because of the similarity of the programs, voters are undecided. The cover by Rockwell for the Saturday Evening Post of November 4, 1944 shows an old man inside the voting booth. He holds his chin in a gesture of doubt while reading the local paper that does not help him much by its titling : Which one ? His pockets are filled with printed papers attesting that he considers the issue with the seriousness required to a good citizen. The oil on canvas 94 x 74 cm prepared by Rockwell for this cover is estimated $ 4M for sale by Sotheby's in New York on November 21, lot 12. The art of Norman Rockwell is meeting a turning point in 1939 when he leaves the suburbs of New York and settles in Vermont. His observation of life in small towns will appeal to the readers of The Saturday Evening Post. His pictures that highlight the small occupations contribute to the American nationalism, and this feature is particularly appreciated in those times of war. The American diversity is not ignored: from 1943 to 1948, Rockwell often travels in the eastern United States, up to Georgia. Close to the readers of the magazine, the artist likes to show himself in scenes of provincial visits. On November 19 in New York, Christie's sells an oil on canvas 84 x 160 cm on the theme of Rockwell's visit to a country editor, published on May 25, 1946 in the inner pages of the Saturday Evening Post. This painting is estimated $ 10M, lot 55. In this scene located in Paris, Missouri, the boss and the employees are in a hurry for the preparation of the local newspaper in their small workshop looking like those of the ancient times, with bulky typewriters and with souvenirs stuck to the wall. The characters form several groups. In the center, the editor seated at his desk is preparing an article while listening to a comment from his printer. On the left, a working boy maliciously trades a paper with a pretty secretary. Further to the right, three people are talking. A seated man learns the death of President Roosevelt, which is the main topic in the current edition of the newspaper. Rockwell, recognizable by his pipe and hat, is just entering into the room. Through such details, precise, picturesque and full of life, Rockwell registered and displayed better than any other artist the everyday life far away from the big cities. He is now acknowledged as one of the outstanding American artists of his time. Norman Rockwell was an illustrator. Time has passed and the world has changed. Some of his pictures, even among the most funny, have become an almost sociological testimony. He was a meticulous professional who did not enjoy fame and city. He settled in a village in Vermont where he observed the behavior of his neighbors with a freshness that pleased all the Americans. Designed from an assembly of photos that has been preserved, The Gossips is one of the most daring compositions by Rockwell. This image published in colors on the cover of the Saturday Evening Post on March 6, 1948 was one of the most popular. The gossip is spread by word of mouth, either directly or using the phone by a suite of fifteen characters successively in position of receiver and transmitter. Although the faces are very similar to their photographic models, each of them has the look of a very expressive caricature. As always, the final art by Rockwell was an oil on canvas. This one followed the same path as Saying Grace, recently discussed in this group: it was donated by the artist to the art editor of the magazine, Kenneth Stuart, and is for sale on December 4 in New York by Sotheby's. This 84 x 79 cm painting is estimated $ 6M. Here is the link to the catalog. The uniqueness of this artwork had once pleased the readers of the magazine and still appeals to today's collectors. It was sold for $ 8.5 million including premium. The Second World War is over but it will not be the last war. American people wish to be comforted. Their favorite artist is not an intellectual of the big city but Norman Rockwell who since 1916 draws with humor the varied themes of everyday life for the covers of the Saturday Evening Post. Rockwell's images are the result of a lengthy preparation in consultation with the editor. He imagines the action, finds photos that he cut and assembles, and performs sketches before the final oil on canvas. On November 24, 1951, Thanksgiving Day, when the magazine publishes Saying Grace, its publishers are aware that it is the masterpiece of the artist. The accompanying text clearly indicates that this grandmother who prays with her five year old grandson expresses the best that life can bring to the Americans. Rockwell has placed the group in a restaurant with tight tables, from a low point of view inviting the observer to feel that he is sitting at the next table. Two young men complete this family, watching with sympathy the two main characters. Four years later, the Saturday Evening Post asked its readers to identify what was the best cover by Rockwell. They praised Saying Grace. In 1953, the oil on canvas 109 x 104 cm was given by Rockwell to the art editor of the magazine, Kenneth Stuart. The artwork remained in the Stuart family. It is estimated $ 15M, for sale by Sotheby's in New York on December 4. Here is the link to the catalog. This image was considered sixty years ago as the masterpiece of Rockwell. It is still the case. The original oil painting was sold for $ 46M including premium. 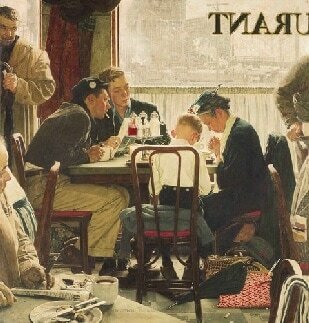 From 1916 to 1963, 322 oil paintings prepared by Norman Rockwell illustrated cover pages of The Saturday Evening Post. This popular weekly magazine offered to the American middle class short and serial novels and true stories. Rockwell observes the occupations in the small town, the empathy between the characters, the sometimes excessive or gently caricatural emotions aroused by the multitude of situations in everyday life. He lives since 1939 in Arlington, Vermont, where his neighbors like to serve as his role models. His war illustrations are patriotic but he does not venture into politics, contrasting with the often more committed opinions of the newspaper. A scene by Rockwell must narrate the whole theme in one picture and the simplicity of the story masks the complexity of the composition. The long process of creation begins by assembling selected photographs. After the sketches, he often makes several preparatory paintings and it is sometimes difficult to identify now which had been the final art for the edition. His fun is poor and fortunately scarce. The dog sitting in the middle of a narrow street in which he blocks the traffic is distressing. Painted in 1949, Road block was sold for $ 4.7M including premium by Sotheby's on May 18, 2016. On May 23 in New York, Sotheby's sells Two Plumbers, oil on canvas 100 x 94 cm, lot 42 estimated $ 5M. This picture made the cover of The Saturday Evening Post on June 2, 1951. In a bourgeois apartment, two plumbers have finished their work. The chief, recognizable by the fact that he has a notebook in his pocket, found a bottle of perfume from which he sprays onto his fellow who holds the tools. A Pekingese dog huddled behind a wastebasket shows his disapproval. The chief thinks himself clever and his workman smiles stupidly. The dirt on the hands and overclothes of a plumber after the completion of his task is inevitable and is not laughable. This derision of a workman to amuse the post-war petty bourgeoisie would scarcely be acceptable today. In 1957, Norman Rockwell completely controls his art which is similar to no other. His compositions are increasingly complex. He captures a theme that greatly appeals to the readers of the Saturday Evening Post: the occupations of young people. Rockwell's nice irony moves the parents. Each composition is a long development that lasts several months, forcing the artist to work in parallel on all projects still to be published. He assembles a large number of black and white photos made or collected by himself, up to 100 for a scene with many characters. The final art in color supplied to the editor is an oil on canvas. The cover page of 2 March 1957 is entitled The Rookie (Red Sox locker room). Amidst the star players of the baseball team, a tall 17 year old boy prepares for his first game. The original painting 104 x 99 cm is estimated $ 20M for sale by Christie's in New York on May 22. The cover page of 25 May 1957 is entitled After the Prom. Two teenagers, boy and girl, relax sitting on bar stools after the ball of the students. The original painting 79 x 74 cm is estimated $ 8M for sale by Sotheby's in New York on May 21. I invite you to play the video shared by Sotheby's. After the Prom was sold for $ 9.1M including premium by Sotheby's. Baseball is more than ever a popular theme and the interest in the art of Rockwell is growing. Very good result at Christie's for the Rookie, $ 22.6 million including premium, in line with an estimate that was ambitious.